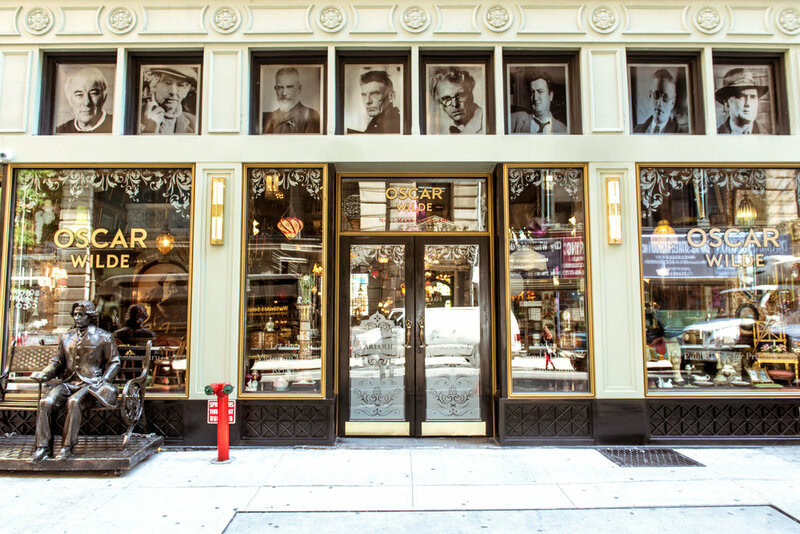 Conducting this knowing symphony of ornamentation are Tommy Burke and Frank McCole, maestros of three other restaurants in the city, each with reverberations of Oscar Wilde: Lillie’s, Lille’s Times Square, and the Papillon Bistro. 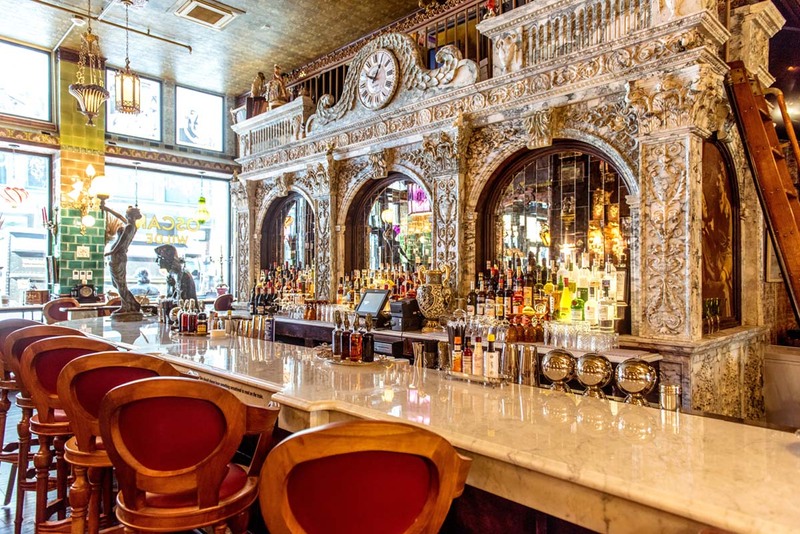 Each of these restaurants in its own way is ornate and unique. Or, as Gwendolen says about the name Ernest in Wilde’s The Importance of Being Earnest: each has “a music of its own” which “inspires absolute confidence.” This is perhaps why the owners, stirred by these lyrical overtures have been persuaded into such philharmonic proportions with a homage to the man himself. There is every reason for the owners to be serious about their Wilde. They know, as documented here, that Wilde visited America for an entire year in 1882, and spent more time in New York than anywhere else. Of course the decor has taken all the attention, so I shall not repeat the superlatives. The features are listed here, and to save a thousand words is the reason we paint these pictures. Instead let us focus on the experience. So fearing for my sanity (and, incidentally, as official advisor to the Beverage Director on all drinks Wildean), I thought I should be more circumspect in my carousing, so I decided to limit my intake to two drinks. But how to achieve this stricture and still remain eclectically Wildean? Here’s how: my first drink was the Oscar Wilde Potent Elixir, a house cocktail of cognac, champagne, gin, cassis, lavender, orange zest, and Guinness. This I washed down with my second drink: a bottle of iced Champagne—”a favorite drink of mine” agreed Oscar, under oath no less. And that, as those counting will agree, is only two drinks. It just sounds more. 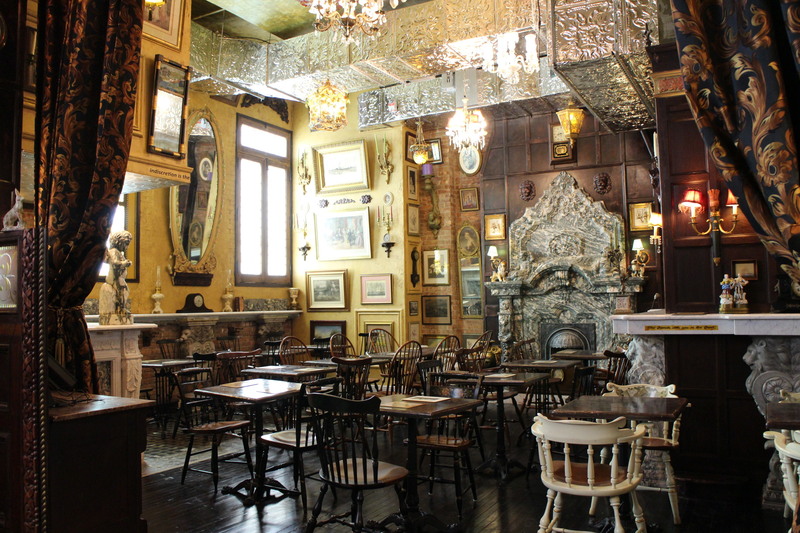 As you are probably beginning to realise, the Oscar Wilde Bar is a very easy place in which to imbibe. Why is this I wonder? Everyone talks about the (eventually) staggering choice of 32 beers and 300 (!) 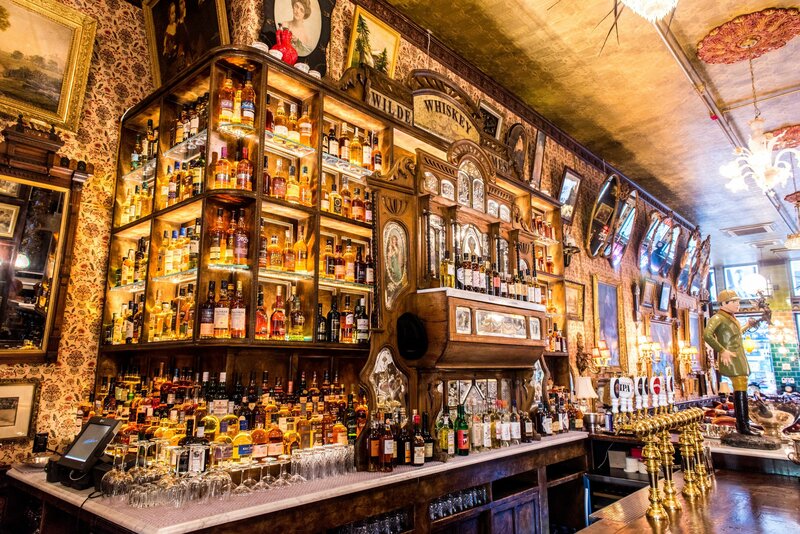 whiskeys; and then there is New York’s longest bar, which yes, is an impressive stretch of fair-trade Vietnamese marble. But as with all temptations, the devil is in the details. Anyone who has been to a New York happy hour will know that bar-hogging is both a bane to service and a barrier to getting served. 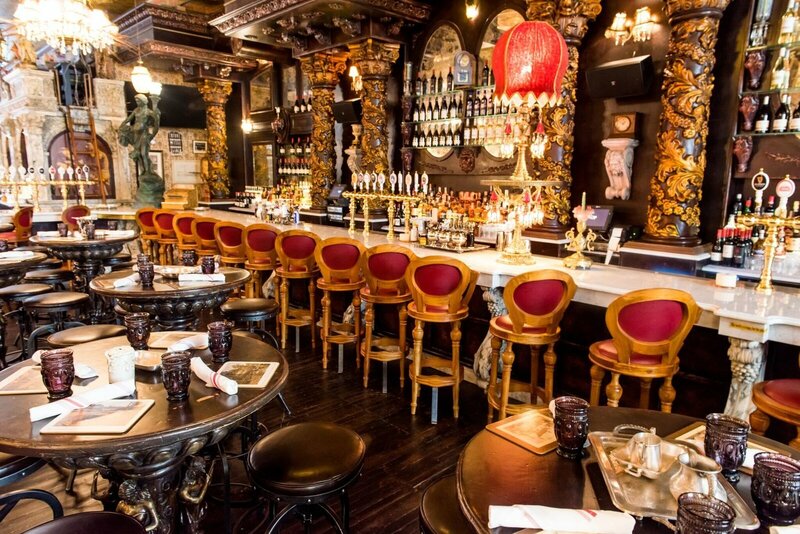 However, at Oscar Wilde, punctuating the entire length of the bar is a line of revolving one-armed barstools. This idea, I have worked out, simultaneously encourages patrons sitting at the bar to bend an elbow while permitting patrons standing near the bar to insert one. An ingenious fusion of form and function. Experiencing the Wilde style, however, does not only mean indulgence. The twin vision of Tommy and Frank is to create space in which to indulge that is both expressive and evocative of Wilde’s actual life and times. 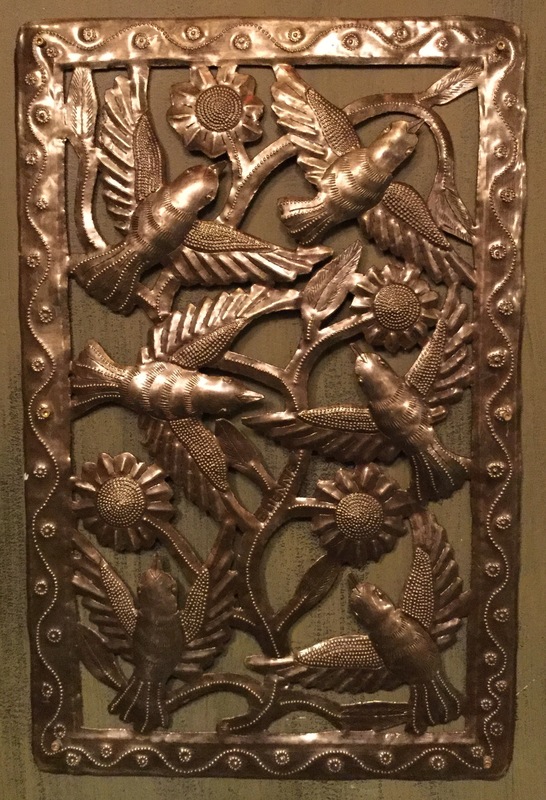 Expressive of Wilde’s times in the sculptured surroundings which immediately have a character destined to encourage familiar meetings and favorite nooks. There are pediments and podiums; statements and stained glass. One can dine behind curtains or sup beneath statues. Even a visit to the bathroom is like a steady-cam tracking shot from a time-travel movie. 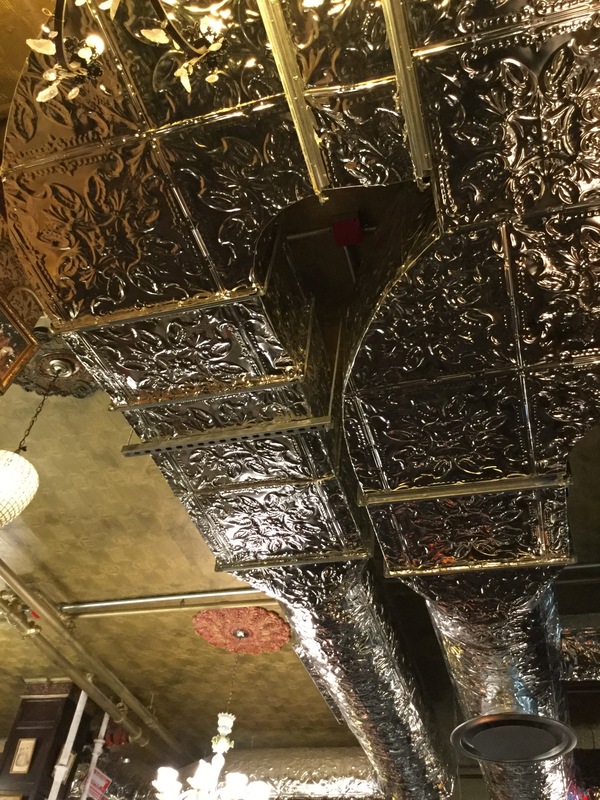 And if you’ve ever wondered what air-conditioning ductwork would have looked like had it been around in Victorian times—and, let’s face it, who hasn’t?—this is the place to find out. And evocative of Wilde’s life in recognizing that, as in any Wilde story, there is a subliminal message. In this case, the irony of a building once the office of Prohibition Enforcement but now decorated with the Priest’s quarters’ porcelain and tables that once served nuns. Hidden clues abound: of sunflowers and peacock feathers, and quotations etched in stone. There is mahogany from Ireland where Wilde was born; a case clock from London where he lived; and a fireplace from France where he died. And the discrete placement of 26 antique clocks all set to ten minutes to two, to mark the time of his demise. As you can see, this bar is no frivolous idea, and, of course, you must go. Go, not just for the owners’ twin vision, nor even for your own double vision. Go for Oscar’s sake. To keep alive his legacy of decadent self expression. You’ll find the whole place is an instant classic, like an old friend you’ve been visiting for years. Of course, you haven’t. Not yet. 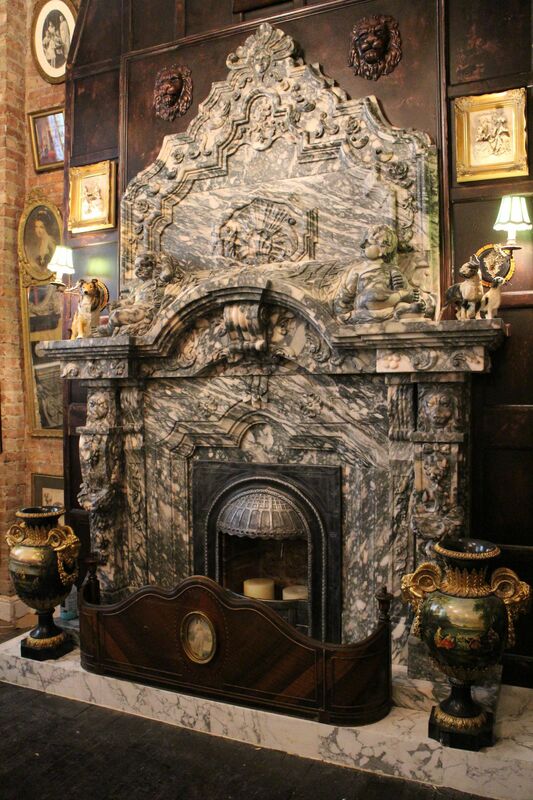 The genuine French fireplace surround, c. 1840s. An absinthe fountain does not dispense absinthe: it is used to drip iced water into a glass of absinthe, a process necessary to release fragrances and flavors latent in the essential oils.